At the Schedule step of the wizard, select to manually run the SureBackup job or schedule the job at specific time, for example, after the corresponding backup or replication job completes. After this job to chain the job. Typically, a SureBackup job should run after the linked backup or replication job completes. In this case, the SureBackup job will verify the VM backup or VM replica created by the source backup or replication job. In some cases, the linked backup or replication job may not complete until the SureBackup job starts. If Veeam Backup & Replication finds out that the linked job is still running, the SureBackup job will fail to start. 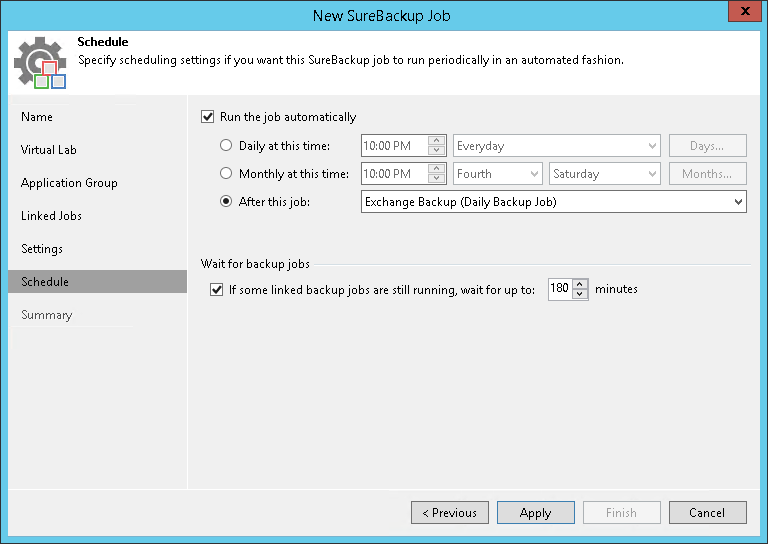 To overcome this situation, select the If some linked backup jobs are still running, wait up to <N> minutes check box and specify the necessary time period in the field on the right. If the linked job is still running, Veeam Backup & Replication will wait for the defined period of time and check the linked job after this period elapses.